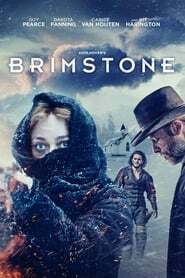 Brimestone is a film directed and written by the great; Martin Koolhoven, a dutch director who has numerous awards to his name. 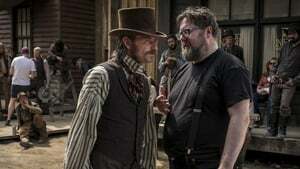 Being mostly shot in the Netherlands, this movie brings a little diversity to what we watch nowadays. A woman is erroneously accused of a crime she could not even think to commit. As a consequence, she is chased by a wicked preacher who has a motive of killing her. The movie is divided into four chapters, namely; Revelation, Exodus, Genesis and Retribution. In the patriarchal and misogynist society, a woman is despised and struggles a lot, which is exactly what Koolhoven tries to depict in his masterpiece. 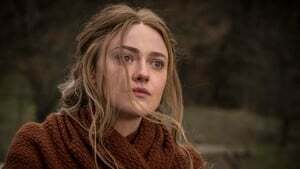 In the first chapter from where the movie kicks off, Liz, played by Dakota Fanning, a mute woman, who lives with her spouse and two step children, is a midwife and communicates through sign language because of her disability. 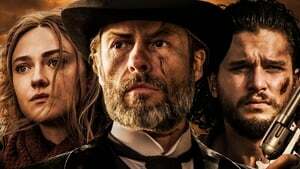 She lives in the wild old west, where she comes across a foul preacher, the reverend (Guy Pearce) from whom she gets highly profane vibes. Inevitable as it seemed, her assumption was accurate and things escaladed to such an extent that she plots to kill The Reverend. As she leaves her home at night to kill him, The Reverend sneaks away and stabs her husband while her children flee the scene and the reverend sets fire to the farm. This concludes the first component of the story. In the second chapter Exodus, a young girl, Joanna, abandoned by her family is picked up and sold to a brothel where a kind hearted prostitute, Sally, takes care of her until she dies. Years pass by and reveal that Joanna and Liz is the same person. Unsurprisingly enough, The Reverend walks into the bar as a customer and pays to get into a room with Joanna and tries to assault her where Elizabeth, Joanna’s fellow prostitute friend, shows up to save her but gets killed. Joanna somehow escapes and cuts off her tongue to take up Elizabeth’s identity and changes her name to Liz and runs away. The third chapter Genesis begins with two outlaws, Samuel (Kit Harrington) and Wolf (Jack Roth) are acquainted to Joanna (Emilia Jones). She hides them in her father’s, The Reverend’s, farm. The Reverend’s wife, Anna refuses to sleep with him, for which he disgraces her in front of a gathering in the church. At this point, his centre of sexual attention turns towards Joanna who had just stepped into womanhood. Meanwhile, Samuel strangles Wolf to death and Joanna finds out about it but upon his explanations that he would have done the same, she forgives him and starts to develop a sense of affection towards him. When Anna stands up for the safety of Joanna from her own father, The Reverend despises, humiliates and tortures her. 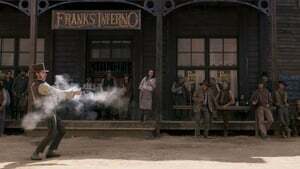 Anna commits suicide in the church in front of a gathering, the same night Joanna makes a failed attempt to seduce Sam and the next day he forces her to marry him. When things do not go as planned, he whips and violates her and kills Sam. The chapter finishes here with Joanna running away from his psychotic father. In the final chapter of the film Retribution, the complexity of the mystery which was previously entwined before in the three chapters dissociate and gets untangled and while every piece of the puzzle falls back to its place. Everything in this motion picture is impeccable: the script is astounding; the taping and altering are amazing; the acting is great. Artistic enough, this film surely serves the divinity of cinematic experiences, and is certainly on top of the recommended list.